Lukas Craggs follows the puck to the net on 3/2/18 against Ferris State. Craggs had a goal and two assists Saturday against Ferris State (Photo by Todd Pavlack/BGSUHockey.com). 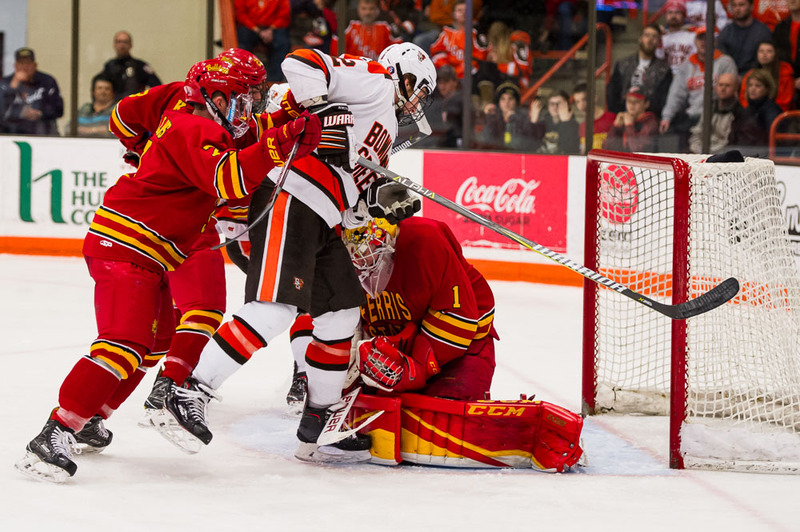 Big Rapids, MI – Saturday night carried a familiarity for the Ferris State Bulldogs and the 12th-ranked Bowling Green Falcons. Like the night before, the teams traded goals throughout and took a 3-3 tie into overtime. But, this time the Falcons ended things in the first overtime to earn all three WCHA points with a 4-3 win. Eric Dop started in net for the Falcons and had 19 saves on 22 shots faced. Roni Salmenkangas stopped 23 of 27 Falcon opportunities for the Bulldogs. Bowling Green responded at 16:58 of the opening period. Lukas Craggs managed to keep the puck inside the Bulldogs’ zone. He sent a wrist shot on net that beat a screened Salmenkangas for Craggs’ tenth goal of the season. Will Cullen assisted on the play was his fourth helper of the season. The Falcons had seven shots on net in the opening period while the Bulldogs had four chances. Bowling Green took their first lead of the game just 21 seconds into the second period. Brandon Kruse sent the puck to Max Johnson who was just to the outside of the Bulldogs’ goal post. Johnson’s second shot on deflected off Salmenkangas’ pads and into the net. The goal was Johnson’s ninth of the season. Ferris State tied the game at 12:31 of the second period. Corey Mackin sent a shot on net that Dop gloved. However, before the referee whistled for a stoppage Mackin knocked the puck out of Dop’s glove and over his shoulder for the tying goal. The Bulldogs had 11 shots in the middle frame while the Falcons had eight opportunities. Ferris State took a 3-2 lead at 1:09 of the third period on the power play. Lucas Finner re-directed a shot from Cameron Clarke for the Bulldogs third goal. Bowling Green responded just 1:30 later. Lukas Craggs’ shot on net was saved but came to Brandon Kruse who beat a sliding Salmenkangas for his fifth goal of the season. Will Cullen had the second assist on the play. 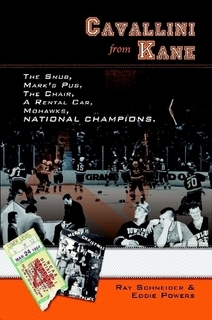 Like Friday night regulation ended in a 3-3 tie and the game went to an overtime period. The Falcons had 11 shots in the third period while the Bulldogs had seven chances. Bowling Green finished the Bulldogs off just 25 seconds into the overtime period. Alex Barber skated down the right-wing boards before sending a shot that beat Salmenkengas five-hole for the freshman’s second goal of the season. The goal was assisted by Alec Rauhauser. With the overtime win, the Falcons improve to 11-3-3, 6-2-2-2 while the Bulldogs fall to 4-11-1, 2-7-1-0. Bowling Green will welcome the WCHA stalwarts Minnesota State to Bowling Green next weekend to wrap up their 2018 slate of WCHA games.